Two independent wheel steering systems. 12 volt, 5 batteries charged by: engine, wind generator, solar panels 1500 W Inverter. 3 x 85 W & 1 x 135 W Solar panels. Battereis are 1 x Engine start 4D & House are 2 x 4D's and 2 x 8D Mastervolt gel batteries. Gas BBQ on pushpit rail. 15 cubic foot refrigerator / freezer powered by an adler-barbour super-cold machine. Main anchor chain is 3/8 BBB there is also 220 ft of 10 mm & 50 ft of 8 mm chain. 3 x Halyard 1 x Reefing & 3 x Sheet winches. A Ted Brewer design built by CC Chen in Taiwan. She is a great cruising boat for a couple with occasional guests, the owner has removed the forward twin bunk cabin to create a second lower saloon, giving the living space of a much larger vessel, whilst retaining the capacity for guests with an occasional double on the stb'd side of that saloon. A light airy interior with an abundance of storage and pilot house configuration gives a great view of your surroundings. She has solar panels and a wind generator meaning she is self sufficient power wise, without running the engine, when sailing in trade wind conditions. Recent engine with under 1200 hrs and standing rigging from 2013, she is, the owner says, ready to go. Some cosmetic improvements would be money well spent. 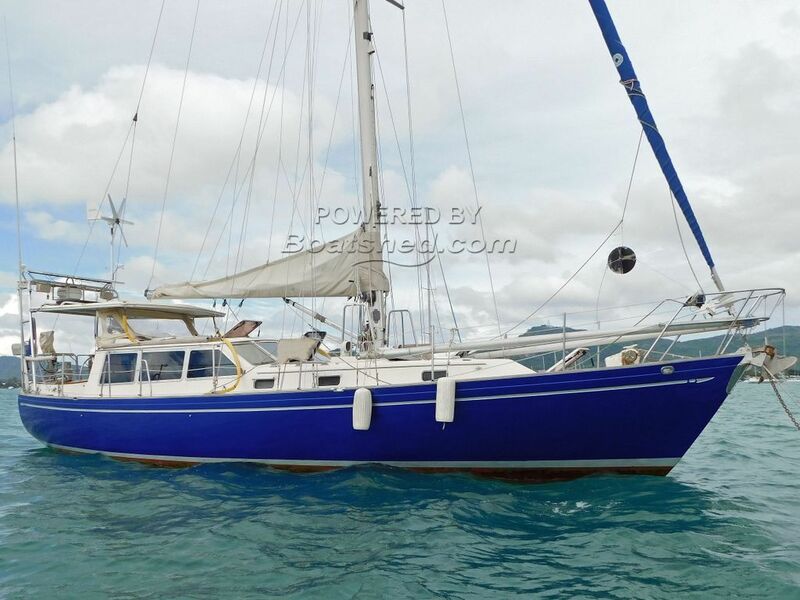 This Ted Brewer Three Seas Fourty Pilot House Sloop has been personally photographed and viewed by Alan of Boatshed Phuket. Click here for contact details.